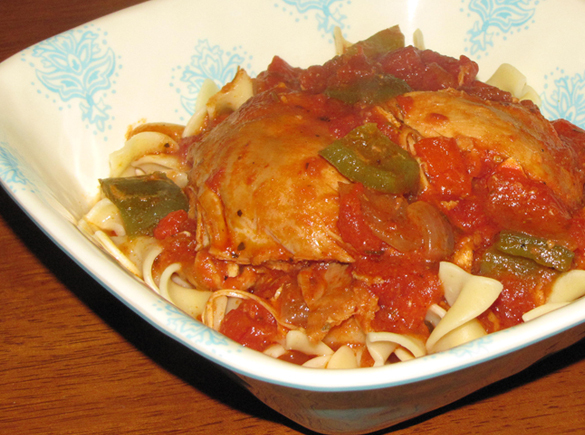 Pinch of Lime: Crock Pot Chicken Cacciatore - the Healthier Way! 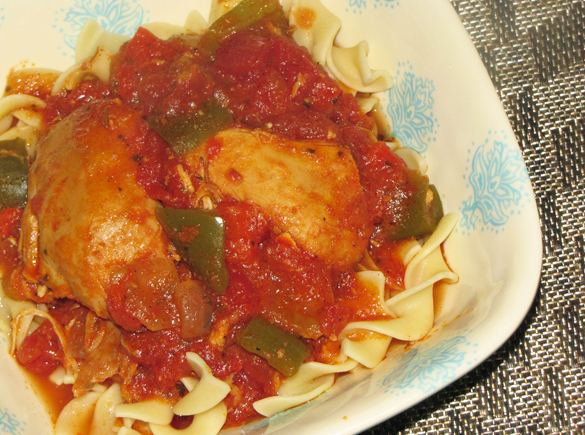 Chicken cacciatore may seem like a healthy meal from the get-go, but it depends on how you cook it and what you cook it in. I've seen lots of oil used in recipes and, well, that just doesn't sound very appealing for a meal that could do without any. That's why I've turned to the crock pot. You don't need to flour and sear the meat this way but you still get a great chicken flavor. And instead of bone-in chicken pieces with the skin on them, I've changed things up to only use skinless, boneless chicken breasts (or a combination of chicken breasts with skinless, boneless thighs) to eliminate extra fat. It's just not needed. This dish is meant to focus on the sauce, veggies and chicken as a whole and the flavor infused by it all. And the flavor is definitely there! It's a very quick meal to put together and you can even freeze it ahead of time to just throw it in the crock pot and go. The frozen method tends to be a little more watery than the fresh, but the flavor is still right on. Either way you prepare it, you'll get a budget-friendly, healthy and super easy meal! 1. Combine everything except chicken in large bowl. Spray Crock Pot with non-stick spray and pour in 1/2 the sauce mixture. Place chicken on top then pour over remaining sauce. 2. Cover and cook on low for 7-8 hours or high for 4-5 hours or until chicken is cooked through. 1. Combine all ingredients except chicken a zip-top bag. Place chicken in a separate zip-top bag. Label bags and freeze until ready to cook. 2. When ready to cook, place everything in the crock pot. 3. Cover and cook on low for 8-9 hours or high for 5 hours or until chicken is cooked through.